Let's take a look on what do we see, when we first get into Heartpace app. To the right there is a Profile info that has to be filled in according to your company profile template created by HR. 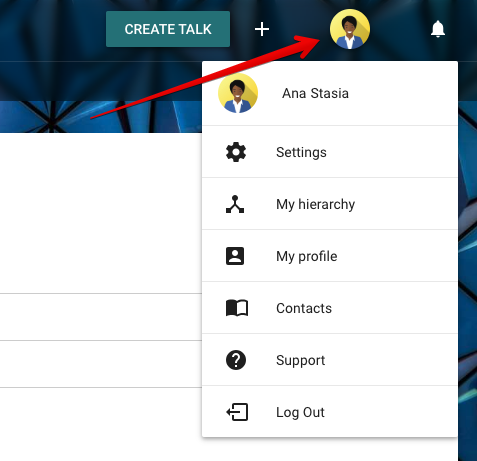 At the top left corner of the Top menu you can see the company logo and to the right Create Talk + button, Bell notifications center and User drop-down menu. This top menu will always be available to give you quick access to main options no matter which page in Heartpace you are located in. 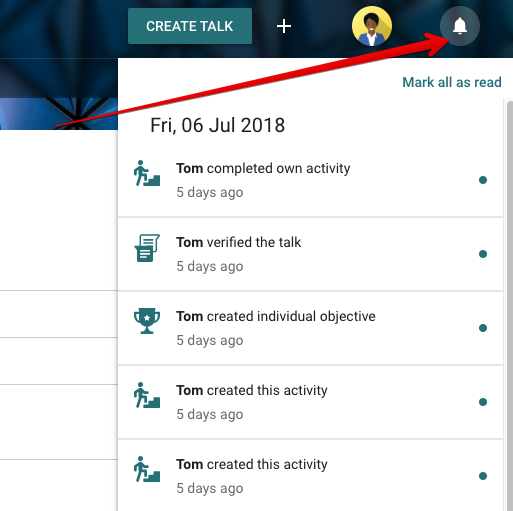 In the Notification Center with the bell sign you will find updates made to your goals, documents and talks you are taking a part in. Some of the options might be missing, depending on your User role and available modules. 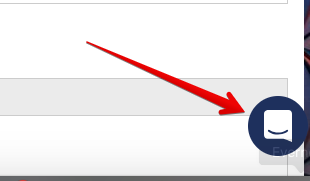 Beneath the company logo you will find the tab menu. As well as actions in Start button some of the options also night be hidden depending on you user role. 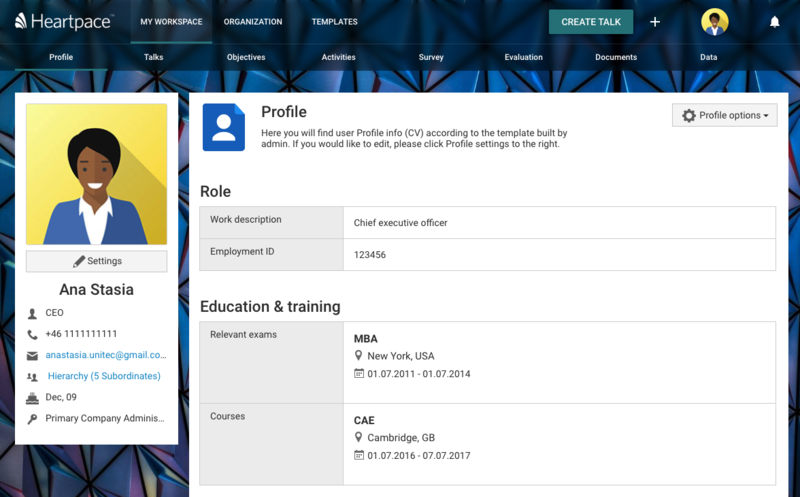 Profile - here you will find user Profile info (CV) according to the template built by admin. Talks - here you will find all your personal or subordinates Talks. Objectives - in the list are all your personal or subordinates objectives, in the short or long term. Activities - in the list are all your activities. An activity can be linked to an overall objective. Survey - in the list you will find all company Surveys you take part in. Evaluation - here you will find all your evaluations like 360° or project evaluations. Documents - in the list below you can find all documents that you have uploaded or that are shared with you. Data - in the list you can find and use available data sources. Alignment - overview of how your objectives and activities guide against overall vision and strategy. Statistics - here you can generate report for individual and direct conversations by set filters. Data export - you can find export files that you have generated or ones that were created by others. DSM - in the list you can find and use available data sources. Templates - create or edit templates for talks, surveys and evaluations or user profile template(CV).